Level 3-2 is the second level of Fire Mountain in Mario vs. Donkey Kong. The high score for this level is 32000. The level opens with a cinematic showing Mario jumping onto a Kurasshā and riding it up to reach a higher platform. The first area has a Firebird that flies around and drops fireballs onto the player. The player first has to ride a Kurasshā upward to reach the Key. The player then must fall back down and jump across a pool of lava and ride another Kurasshā up to a small platform. Next, the player needs to ride another Kurasshā up to reach the locked door. In the second area, the player has to ride a platform to reach the other side with two Kurasshās. Riding the one on the right up, the player can collect a 1-Up Mushroom and reach a platform leading to the second Kurasshā. 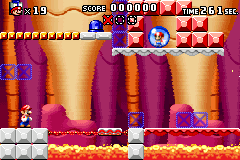 Jumping over a set of stairs, the player then has to press a blue Color Switch and then cross the falling bridge and land on a blue platform below. The player must then follow the same route as before, though they now have to jump across blue platforms. 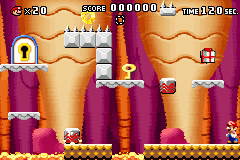 After riding the left Kurasshā up, the player can collect the Mini Mario. Red: In the first area, directly above the player. Yellow: In the second area, next to a rope on the right side of the map. Blue: In the second area, at the end of the falling bridge.